Students will learn about Claude Monet's wall-size paintings of water lilies then create a classroom mural decorated with Monet-inspired water lilies that they paint, cut, and fold into 3-dimensional flowers. By making thier own 3-dimensional water lilies students will understand how Monet's loose, colorful brush strokes come into focus and seem to shimmer when seen at a distance. When the lilies are displayed together in a mural, students will understand the size and impact of Monet's wall-size paintings. • work as a group to create a mural. 1. Show students an image of Claude Monet's wall-size painting Green Reflections while reading About the Art (see below). Ask students to look at the image up close to see the loose, unblended brushstrokes of the Impressionist style. Next, have students stand at a distance to see how the brushstrokes seem to come into focus. Ask them what words best describe Monet's painting. Answers might be: shimmering, fuzzy, colorful. Next, ask students to imagine what it would be like to be a painter who was loosing his eyesight, and what it would be like to get your eyesight back. 2. Show students the virtual tour of the Orangerie Museum. Ask them to imagine what it would be like to stand in the middle of the gallery, surrounded by Monet's shimmering art. Tell them that they too, as a class, will make a wall-size masterpiece. Each one will contribute a painted and crafted water lily for the piece. 4. Now for the lily pond background. Demonstrate how to sponge-paint a sheet of blue construction paper using the Impressionist style -- refer to Monet's Green Reflections painting for color ideas. Note: each student should fill the blue paper as he or she wishes. They do not have to cover the entire piece with paint, but some of the edges should be painted so that the individual sheets blend together when hung. Set up one table, covered with newspaper, for the sponge painting. 5. Hand out lily patterns for students to paint. When they are finished with their pattern they should write their name in one corner and set it aside to dry. Each student should then paint one sheet of blue/green background. Before class: tape the blue/green painted background sheets onto a wall, touching side-by-side, to create a rectangle. 1. Demonstrate how to cut, fold, stack, and staple the painted lily pattern. Note: for this project, you will not add the plastic lid under the lily pad. 2. Hand each student his or her painted pattern so they can construct their piece. When finished, each should write their name on the underside of the lily pad and bring it to the blue/green wall. Help them decide where to place their flower in the pond, and tape it in place. 3. 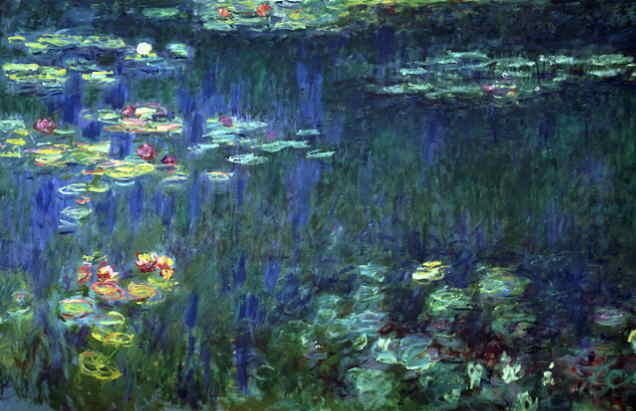 When all lilies are in the pond, ask students to discuss how their piece is similar to Monet's painting and what it is like to stand in front of their shimmering work of art.